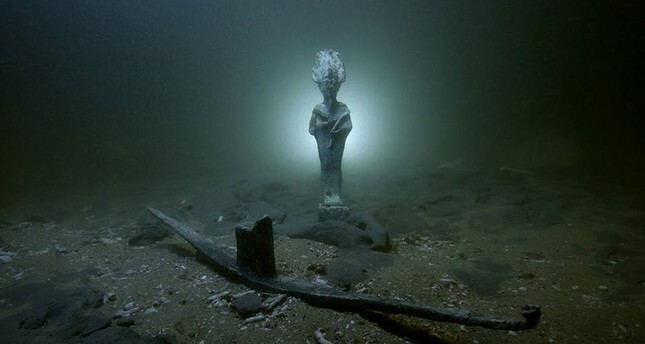 Egypt says archaeologists have discovered three sunken shipwrecks dating back more than 2,000 years to Roman times off the coast of the Mediterranean port city of Alexandria. Tuesday's statement from Mostafa Waziri, the head of the Supreme Council of Antiquities, says the discovery was made in collaboration with the European Institute of Underwater Archaeology. Waziri says the archeologists also uncovered a head sculpture carved in crystal and three gold coins dating back to Rome's first emperor, Augustus. Parts of large wooden planks and archaeological remains of pottery vessels were also found, which could have been part of the ships' cargo. Augustus was the founder of the Roman Principate and considered the first Roman emperor, controlling the Roman Empire from 27 BC until his death in AD 14.